Today, many seem not to bother about the filter their home air conditioning system uses. But you should know that one vital thing that promotes the safety and efficiency of air-conditioning units is its air filter. And using low-quality filters won’t do the unit any good to keep your home fresh and safe. Also, failure to clean and maintain the air filter on a regular basis could cause severe malfunction the unit. Air filter helps to remove pollens, dust, dander, and other airborne allergens. Some also have the power to remove tiniest particles as small as 0.3 microns from your indoor air. Made of cotton, polyester, or metal and it requires cleaning or replacement after prolonged use of your air conditioning units. However, getting the right air filter that will work great with your air conditioner could seem pretty tricky. But you don’t have to worry because we have done thorough research and put together the list of the best Air conditioner filters for home. We have also provided buying guides that will you help make the right choice. It will feel absurd buying an air conditioner filter for home use, and it doesn’t satisfy your needs. Hence, if you want to make your purchase worthwhile, there are important things you need to consider. Here are great buying guides that will help make the right choice. Most Residential home HVAC system makes use of mechanical air filters for better running efficiency. Made of synthetic fibers, it helps to hold down small particles and airborne allergens from circulating in the air. Thus, it keeps your home more comfortable and breathable. To determine the effectiveness of the air filter, you have to know the MERV rating (Minimum Efficiency Reporting Value). Highly affordable air filters have a lower MERV Rating than expensive ones. In other words, the higher the MERV rating of an air filter the more expensive it will get. Also, filters with higher MERV rating have greater effectiveness than lesser ones. This filter effectiveness is determined by the number of pleats per foot and each cost around $10. Hence, to get enough air flow in your home, you will need to get more pleats per foot across the filter surface. With a MERV rating of 10 to 13, they can remove up to 45% of the air pollutant from your indoor air. These thin and simple flat surface panels have a MERV rating between 1 and 4. Designed to trap particles from the air, it also helps to protect your heating air conditioning equipment. The downside to this filter is that they can only remove less than 10% of the air-borne particle from the air. In other words, it won’t help much to improve your indoor air quality. With a MERV rating between 17 and 20, these filters can remove up to 98% of airborne particles from your home. Mainly known has one of the best air filters for whole house filtration and air purifier. The downside about this filter is that it restricts air flow. Hence, to use this filter, you will need an upgraded air conditioner with enough air pressure. This type of filter uses an electrostatic charge to pull out airborne particles from your home. Generally, the filters have a MERV rating between 2 and 10. They electrostatic filter are of two types- the washable and disposable version. The washable types have a MERV rating of 4 to 10, and disposable pleated options cost around $10. Keep in mind that after washing the filters make sure it dries completely before use to prevent the growth of mold and mildew. This is one the most efficient and pricier air filter for Home HVAC system. With MERV rating between 14 and 16, these can remove 85% of pollens, mold, and other airborne allergens. These air filters will also make your HVAC perform better and will also lower your energy cost. All homes might not have the same level of indoor air quality. 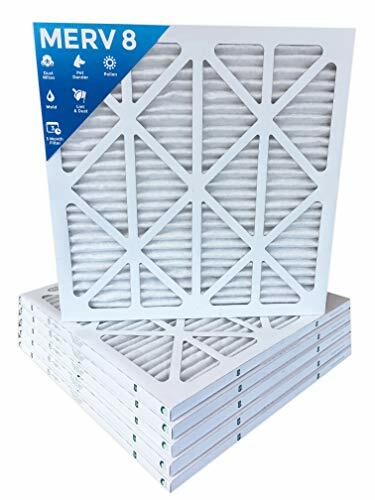 Hence when shopping for air filters, you need to get the best air filtrations system that can efficiently remove the air pollutant in your home. Hence, Instead of settling for cheaper ones get air filter with higher MERV rating above 8. As the names imply, this ranks as one the best Air filter for allergies sufferers. With a MERV rating of 11, this filter will work great to trap mold, pollen, and other airborne allergens. You will get great value for your cash as it has more pleats compared to other filter makers and at an affordable price. Also, with a single purchase, you will get to have a box of 6 pleated Air filter. Here is one of the most economical washable air filters from WEB Eco. With this air filters, you save more on filter replacement, as it can be reused so many times after washing it. Super easy to use and it last longer when compared to other filters on our list. This filter works great in removing airborne particles including pollen and pet dander. The downside to this air filter is that you have to wash it after every few months to keep it in good shape. Shopping for the right size of air conditioner filter could seem pretty hard, but with this 3M filtrete air filter it just got easier. The reason is that the filter has a dimension of 15 x 24 inches which can be easily cut to fit any air conditioner. It also works great to trap pet dander, mold, pollen and other airborne allergens from your home. 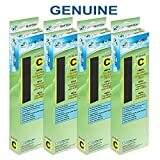 Aprilaire filter works perfectly with most standard air conditioners. 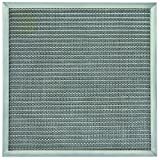 This highly rated filter with a MERV rating of 13 can remove 93% airborne particles out from your home. You and your family will enjoy using this filter as it can keep the air fresh and breathable. The down turner is that due to its size, it might not work on bigger or advance air conditioner. Finally, you have gotten great insight about the air conditioner filter. As mention before, air filters are vital to any air conditioner. It helps to keep the air conditioner in good and to remove airborne particles from indoor air. If you carefully follow the guide and reviews, this will help you make the right choice.